Although I eat mostly a vegetarian diet, I do indulge in sushi (yes, even the fish kind) sometimes, but I carefully watch my calories when I do. Sushi can definitely be difficult to navigate when you are on a diet or watching your calorie intake, since there are so many different kinds of ingredients that can be in a roll. 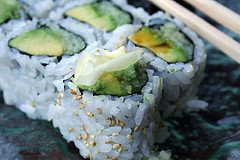 But, it shouldn't be all-out avoided, since many rolls are made with healthy ingredients that are actually good for you (like avocado, seaweed, cucumber, fish). It is all about your choices. With that in mind, I put together some sushi eating tips, staring with a special tip just for those of you out there that don't eat fish. Tip #1: Just because you don't eat fish, does not mean you should steer clear of sushi. There are several yummy and healthy rolls for vegetarians including rolls that contain *only* avocado, cucumber, carrots, or any combination of the three. These rolls are tasty, filling, and make a great, low-calorie (2-4 WW points), crunchy, on-the-go lunch or snack. I highly suggest trying a vegetarian roll if you haven't already. You can buy these rolls at places like Whole Foods (there is no need to go to a sushi bar to get high quality fish, since there is no fish in this sushi). Tip #2: Try to find sushi that is made with brown rice. The difference in taste is minimal (you might even like the brown rice taste better, I know I do), and brown rice has more fiber, making the sushi even better for you. Tip #3: People often ask me how many calories are in a piece of sushi. It is actually easier to calculate by the roll, since different sushi chefs cut different sizes of rolls (for instance, some rolls have 6 pieces, some have 8). Here are a few resources for looking up calories and points for sushi: Calorie King, Peer Trainer, Sushifaq (contains WW points!). Figure out which rolls you want to eat before you go out, and that way you'll be set up for success. Tip #4: Rolls with fried fish in them are not great choices (watch out for tempura or spider). If you are craving something fried or crazy, try just having a piece or two (share the rest with your friends). In most cases, if you want something super yummy, it is smarter to order a "spicy" roll than a tempura or a spider roll. Tip #5: Rolls with one piece of fish (like tekka maki, sake maki, or california roll) or fresh fish slices without a roll (sashimi) tend to be easier to calculate calories/points for than rolls that have many different fish or ingredients in them. Tip #6: If you are watching your sodium intake, try eating rice vinegar instead of soy sauce. However, while rice vinegar generally has less sodium than low-sodium soy sauce, it still has a fair amount of sodium in it, but what makes it different is that a little goes a long way. Another option (again, still contains sodium, just less) is to put a small piece of ginger on each piece of sushi. Tip #7: If you are eating at a Japanese restaurant, miso soup is a great choice to accompany your sushi. It is very low in calorie, and only .5 WW points. Note: Picture by BITTER on Flickr. Sashimi is always a GREAT choice - you must eat fish when you eat sushi or else it is just an imposter!